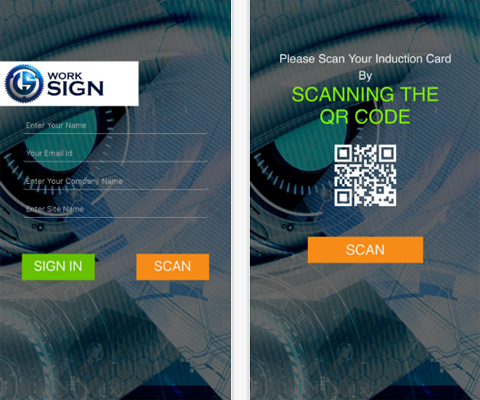 Visitor or Contractor Sign In and management system at reception made easy with our complete portal and visitor sign in app for site based visitor and contractor induction and management. One of the most cost effective, comprehensive and innovative visitor sign in management systems online - see it for your self from the demo opposite! Available for iPad or Android. Induct on important safety and organisation information your visitors either before they arrive on site or as they come to reception as well as tracking their sign in and sign out times on site all from an easy to use and setup signin app. One option is to setup a tablet at reception, visitors and contractors sign in as they arrive on site. It can cross check their induction card if they have been issued with one and ensure they are compliant. 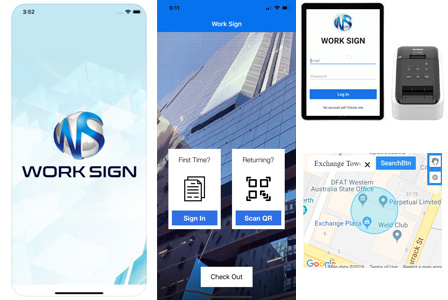 Another option is our Work Sign mobile app which can be downloaded and used to sign in on site directly off a mobile phone. Contractors could sign in and out from jobs they go to across different sites. Ensure an induction is valid and completed at either the sign in or prior to arriving on site. Cross check insurances are valid, certificates are up to date, cross check company overall compliance and set up visitor inductions to be done on the spot upon sign in. For each staff member, contractor or visitor, they can be issued a sticker or induction card. Brand to your organisation, include their photo, QR code for scanning, company details, expiry dates, emergency contact details and more. Ensure that all visitors coming to site are inducted, have a valid card or sticker and are visit safely and be compliant. Track who is visiting your organisation, who they are visiting, how often, how much time on site and what company they are from. Track via GPS visitor, contractor and employee sign ins for different sites. Via on a map the different sign in locations and who signed in at which sites.